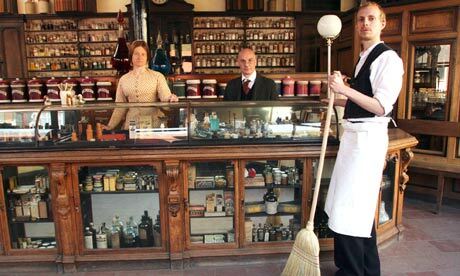 Victorian Pharmacy is a new BBC series recreating the work of an actual Victorian Pharmacy (minus the opium and arsenic, of course). Here's a video with great shots of the interior. Thanks to Robert Williams Hitchin for pointing this out. Really? I want to see it! Fab fab! I saw this being filmed at the Ironbridge Blists Hill Victorian Town. I went back there a couple of weeks ago, the shop sells Victorian era items - I bought a nice block of carbolic soap which I put in with my vintage clothing in storage to give it that authentic whiff! So glad you decided to post about this. Can't wait to watch it! That wonderful photo reminds me of the last surviving chemist's store still open in 1970 in the town where I grew up. Not just the look of the shop with its huge glass colorboys, but the scents!